There are two plants called Darrichwax in different areas of the Deitscherei, but, by far, the more common one is known as Boneset or Thoroughwort in English and as Eupatorium perfoliatum as its taxonomic reference. The Darrichwax ("grow through") name does indeed refer to the way the stem and the leaves are connected and would also account for the English name "thoroughwort." The aerial parts (leaves and flowering tops) are used in herbal medicine. Boneset is usually taken as a tincture/extract or as an infusion/tea, but it can also be used topically as a poultice for some skin problems. Traditional uses by the Lenape and the Deitsch included the relief of fever and the common cold. It also loosens mucus, thus functioning as an expectorant through coughing. It stimulates the ability of the body to fight off viral and bacterial infections, rheumatic illness, skin issues, and worms. Because of the wide range of herbal medicinal uses, the Deitsch generally viewed the plant as a cure-all. It was also used as a purgative/laxative and (in excessive portions) as an emetic (causing vomiting). Even now, albeit less common than in earlier times, there is a Deitsch tradition of pulling the leaves upward from the stem if one wants to make an emetic and of pulling the leaves downward from the stem to make a purgative. Of course, this reflects whether one wants to "throw up" or to "throw down." The plant is best harvested when the flowers are in full bloom. Another old tidbit of harvesting lore is that it is harvested when the moon is waning if to be used to remove a fever and when the moon is waxing if it is to be used as an emetic or purgative. The name "Boneset" comes from the Doctrine of Signatures, which states that the appearance and characteristics of plants reveal how they can be used, which took into account the appearance of the plant and believed it could be useful in knitting broken bones. That is not the case; however, it can be used for treating fevers that are associated with broken bones, so perhaps the Doctrine authors were not totally incorrect in their assertion! 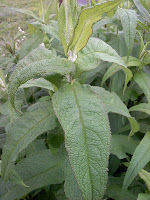 Some folks say that Boneset Tea works better than boneset tincture as a remedy for fevers. I can say from personal experience that the tincture does a wonderful job in combating fevers. Just be advised that one way it fights fevers is through causing sweating... and I do mean SWEATING! Also, be advised that boneset should be used for episodes (like during the time of a cold) and not frequently or routinely. It can be toxic if taken in excessive doses or over too long of a period of time. Other, more magic-oriented uses among the Deitsch include carrying the leaves for protection, breaking of hexes on property, and the driving away of harmful spirits. The plant can get quite tall (usually up to 5 ft. but I have seen some taller). When I harvest it, I tend to cut the plant leaving about 1 ft. of the base intact. Boneset is perennial. The plant's dead remnants can serve as an overwintering spot for some beneficial insects, so I do not cut the final stalks down to the ground until after May 15 unless I see new growth starting. I still have some beleaguered-looking green leaves on a couple of stems outside. Boneset, particularly when young, is often confused with a related plant, Joe Pye Weed (also known as Gravel Root in English, Inschingwatzel in Deitsch, and Eupatorium purpureum in taxonomic Latin. The leaves have different textures, but it is easiest to discern between the two plants when they are in full bloom because Joe Pye Weed has pinkish purple flowers and boneset has white flowers. However, there is a short period in early bloom in which some Joe Pye Weed flowers look more white than pink... Go figure! Disclaimer: This information is for educational and discussion purposes only. Nothing in these posts is intended to constitute, nor should be considered, medical advice or to serve as a substitute for the advice of a physician or other qualified health care provider).